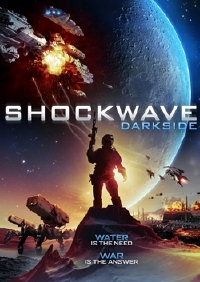 Jay Weisman's ten-year labor of love, the indie Sci-fi flick Shockwave: Darkside hits VOD January 5 from Uncorkâ€™d Entertainment, so we thought we'd share a new trailer for the film. The movie stars an impressive cast including Bill Sage (Boardwalk Empire), Mei Melancon (Nightmare Code), Sonequa Martin-Green (The Walking Dead) and Rich Ceraulo (Supergirl). Five soldiers, shot down and behind enemy lines in a battle over water, frozen in the deep craters of the lunar surface, find themselves marooned on the dark side of the moon. With depleting air and supplies, they have no choice but to start a dangerous trek through hostile territory. As their numbers dwindle and nerves fray, they make an amazing discovery about the moon that just might save their lives, but destroy the very cause that they are fighting for. Was that an original Cylon in one of those scenes? I'd let them make an Armada screen adaption. I think it's supposed to be look kind of the way it does.